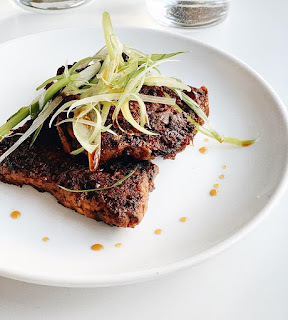 Omni have taken over the kitchen at Louie Louie, the bar and restaurant at 347 Walworth Road, serving Mondays to Saturdays until 8th March 2019. Omni aim to feed everyone with their hearty and substantial vegan food. "Omni is a somewhat confusing name. For many it means omnivore, those who eat meat and vegetables, those who eat everything. We decided to call ourselves Omni because instead of eating everything, we feed everyone. Our aim is to bring people together, to sit around the table as we did, sharing laughter and tears. Sharing a meal. We believe that whether or not you are vegan, whether you are muslim, kosher, halal or whether you are omnivorous, for one meal we encourage everyone to sit down and share. We are open at Louie Louie, Walworth every Monday – Saturday from 6pm – 10pm. From 3rd January – 8th March 2019 we are serving up a menu of small plates and large plates, designed to be shared."